Prey species vary from location to location, flat to flat, day to day and even hour to hour. Sometimes it seems that fish will eat whatever you put in front of them. Others they are maddeningly selective. What does this mean? Having a basic understanding of prey items available in a given area is very useful. Probably the most prevalent little critter available anywhere in saltwater is a crab of some kind. I have read that crabs (and crustaceans in general) are more prevalent under water than insects are the air. That’s kind of astounding when you stop and look at the ground and realize that there is always a bug there somewhere. However does this mean that crustaceans are always what is being eaten? Probably not. It does make it a very good place to start when choosing a fly for the day. Do you need to have an ultra realistic crab fly? Some permit guys in Florida are tying amazing looking stuff now. Those flies are finding their way into flyboxes being used for redfish by anglers in more … “urban” fisheries like Biscayne Bay and Mosquito Lagoon. But they are not always needed. Usually the presentation beats the pattern. Fish a fly the way you can imagine a certain creature behaving and anything could work. Shrimp swim with a certain jerky pattern; a couple fast jumps and a pause. Crabs can move quite quickly along the bottom when necessary and they they stop and swing their claws around, even the little ones, they think they’re tough. Minnows move pretty steadily, except for the ones not having a good day, they will move slowly and often stop swimming. ( I did a presentation once at the fish tank at Bass Pro in Concord, NC about how to fish a Clouser to imitate all these. I cut the hook point off and wouldn’t you know it, a crappie ate the thing. ) So if you see minnows schooling on a flat and redfish smacking them, they will break the surface and be moving fast, a baitfish profile such as a Baitfish Head Minnow will be just the ticket. If you see a school of fish moving slowly down a shoreline and sporadic breaks on the surface and shrimp jumping clear, a Seaducer will work just fine. If you see redfish moving slowly along over a flat, with occasional flash of gold as one turns one way or the other, then a crab imitation like a Sculpin Helmet Critter will be just the ticket. These types of things can be applied to any fish that you see feeding anywhere either in a school or singly. 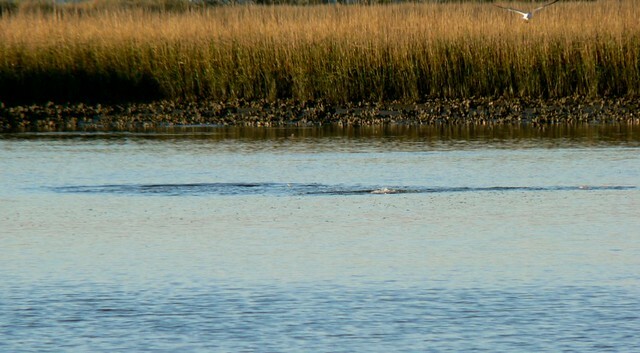 Classic example of reds chasing minnows in shallow water.